Daily Illuminator: Munchkin Gift Pack In Stores Now! December 4, 2017: Munchkin Gift Pack In Stores Now! The perfect trifecta of gift-giving glee is hitting stores now: the Munchkin Gift Pack! Complete your holiday shopping in one fell swoop with three different Munchkin games, perfectly wrapped in a variety of Munchkin-themed wrapping paper, including gift tags, all in one box. Plus we even throw in some new holiday Munchkin promos, illustrated by Len Peralta! We always leave a little something for Santa. We've included a few of our harder-to-find hits from the past year, including Munchkin Grimm Tidings, Munchkin Spell Skool, and Munchkin Lite. Two of those (Grimm Tidings and Spell Skool) were only released at Walgreens stores, so some people may not have been able to get their hands on them. Munchkin Lite features many of the classic cards of the original game, re-illustrated by John Kovalic with all new art! You could even mix them together; check out Munchkin Czar Andrew Hackard's articles on mixing sets, featuring Grimm Tidings and Spell Skool! 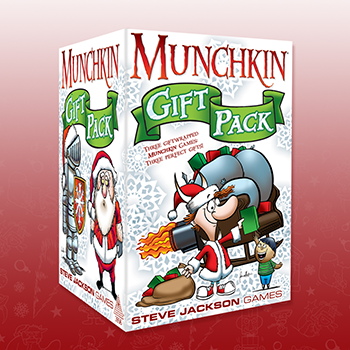 You can find the Munchkin Gift Pack now at your local game store, or on Warehouse 23 if you don't have a store nearby. Get it now, and check "buying gifts" off your long holiday to-do list!